The greed of owning ancestral property worth over Rs 1 crore had led two sons and their six accomplices to shot at their father and whisk away with badly bleeding victim, fearing dead, in two cars at Noorwala road late last evening. The overnight rain seems to have added to the woes of the people here as the day temperature continued to remain below normal. Although the night temperature increased a little bit, that did not provide any respite from the intense cold. Meteorological experts maintained that the weather was likely to remain so for another 48 hours. Ending days of parleys of striking a compromise between subdivisional magistrate (SDM-East) Jagvinderjit Singh and his estranged wife Navdeep Kaur, the city police today booked the SDM for beating up his wife and her mother. 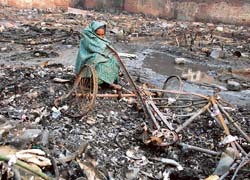 As many as 100 migrant families from Bengal were rendered homeless after a major fire broke out in their shanties reducing everything to ashes in the wee hours at Islam Ganj area behind Manju cinema today. In a dare-devil attempt, a young boy jumped into a canal near Doraha to save a couple which had incidentally fallen into the canal. Though the boy Balbir Singh managed to save the wife, he could not pull out her husband from the canal who subsequently drowned in the water. The city police has nabbed 5 criminals of a gang who were accused of involvement in several robberies and murder of a night watchman Jang Bahadur in Gopal Nagar last month. Dr G.S.Bains, head, department of agrometeorology, PAU, Ludhiana, has said that the city received 13 mm of rain during the past three to three days. Today’s figure being 3 mm (till 2.30 p.m.) and that the weather will remain cloudy during the next 24 hours. The music club of Guru Nanak National College, Doraha, organised a musical programme entitled ‘Classical and Light Music’ in the music hall of the college yesterday. Principal Dr Narinder Singh Sidhu chaired the programme. 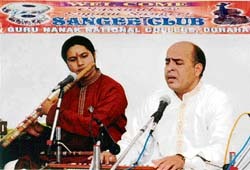 Prof Neeraj Gandhi cast a spell on the audience for hours together by singing ghazals. The Guru Nanak Dev Polytechnic Alumni Association recently organised its general body meeting on the college premises. During the meeting, the old executive committee was shelved and the new committee constituted. When a person visits a place of worship, something inscrutable happens to his soul. He seems to be in another world where he is in communion with the divine spirit. At such moments he is oblivious of his needs and concentrates on his craving for the unknown. Indeed the “finite” heart yearns for the “infinite” glory. The mechanical engineering department of the Bureau of Indian Standards conducted a seminar on standardisation for sewing machines here yesterday. Fire in shanties and a subsequent rainy day means sleeping outside in the open on a cold winter night for the families of jhuggi dwellers who lost everything belonging to them this morning. Though it did not mean huge losses to the evaluators as only jhuggis were burnt, it meant losing homes for the dwellers who had been living in this plot, owned privately by a scrap dealer for the last 28 years. The city police took more than 50 persons belonging to various Hindu and Sikh organisations under preventive custody to avoid untoward incident on a bandh call given by some Hindu organisations tomorrow and call by Sikh organisations to protest the bandh. To accelerate identification of stolen vehicles, the Payal Circle police has established a mobile stolen vehicles checking unit that will monitor random checking of vehicles in the area. The unit, besides watching out for stolen vehicles, will also circulate information about fresh thefts to other units of the state. Getting hazardous water treated at the Common Effluent Treatment Plant (CETP) would cost industrial units less now. The Ludhiana Effluent Treatment Society for Electroplating Units, the Special Purpose Vehicle (SPV) formed for the purpose of putting to operation the Common Effluent Treatment Plant (CETP), has reduced per litre charges from 46 paise to 40 paise for treatment of water up to 10 lakh litres, and from 40 paise to 32 paise for quantity between 10 lakh to 20 lakh litres. The minimum monthly charges, too, have been slashed from 1,500 to Rs 1,000. Students of Ram Lal Bhasin School participated in a ‘Child for Child Programme’ recently. They donated generously for the welfare of underprivileged children through the Smile Foundation. This foundation reaches out to over one lakh children every year through various education and health care projects across the country. Film star Dharmendra has lauded the initiative of the Malwa Sabhyacharak Manch, a city-based social body, headed by Krishan Kumar Bawa, in motivating the people of the region to celebrate the festival of Lohri for the newborn girlchild. The mega star also evinced keen interest to participate in the next Lohri mela to be organised by the manch. 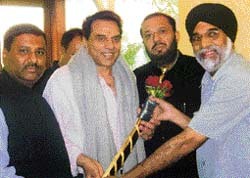 Krishan Kumar Bawa, chairman, and other functionaries of the Malwa Sabhyacharak Manch, felicitate film star Dharmendra on his birthday in Mumbai. A delegation of 11 Thai students of Sahibjada Ajit Singh Academy, Ropar, visited Punjab Agricultural University yesterday along with their teachers Dharam Dev and Anupam. The paediatrics department at Christian Medical College and Hospital (CMCH) here has now added the services of a neuro-development clinic to its general services for children. This clinic would cater to disabilities of children, related to their normal brain development and also to various learning and behavioural problems. 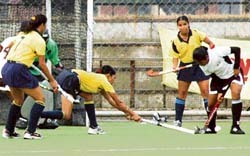 The Northern Railway, Delhi, survived numerous anxious moments before romping home victorious against the Western Railway,Mumbai, 2-1 to win the title in the XIth All-India Mohinder Partap Singh Grewal Women’s Hockey Tournament that concluded at Prithipal Singh Astroturf Stadium at Punjab Agricultural University, here today. All goals were scored in the first half. Bikram Singh Majithia, minister for water supply, sanitation and information and public relations, Punjab, has stated that the state government has chalked out a comprehensive plan for promotion of sports.